Sage Peak Outfitters' purpose is to provide a superior wilderness experience in some of the most beautiful country known to man, with comfortable accommodations, steady horses, hearty home style meals, experienced guides, knowledge of the Lee Metcalf Wilderness Area including its resident and migratory elk to hunting enthusiasts at any level. We also provide private ranch elk, deer and antelope hunts with cabin accommodations, home cooked meals, experienced guides with knowledge of the 40,000 leased acres, exclusively set aside for our hunters. These are first rate hunts for every level hunter. 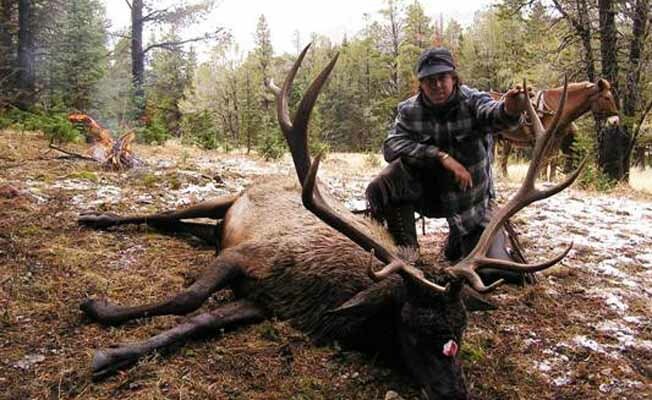 Established in 1927, Sage Peak Outfitters' hunting camp is in the same exact spot it has been for decades upon decades. It was set in the prime location to make hunting the area very efficient. Adjacent to Yellowstone National Park, the Lee Metcalf Wilderness Area encompasses approximately 259,000 acres of large sweeping meadows, timbered ridges, rugged peaks, and deep canyons, offering the hunter an exceptional experience in a most remote part of the world where many only imagine. Though generations of outfitters have come and gone in this area, Sage Peak Outfitters perseveres in being the only licensed overnight outfitter in the available 34,000-acre Monument Peak Unit. Visit our website to get an idea of a week's hunting itinerary, a tour of our wilderness backcountry camp and our hunting area. Feel free to call with any questions!